Democrats may stand little chance of restoring net neutrality in Congress, but they are looking to make preserving the open internet an issue in this year's midterm elections, Axios' David McCabe reports. 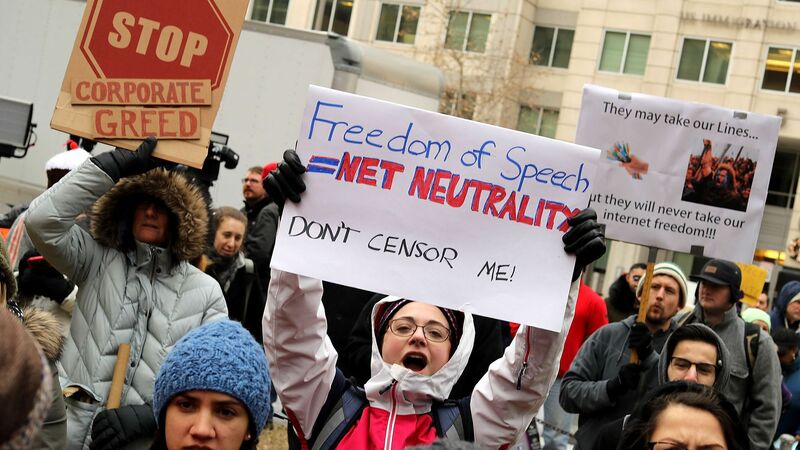 Why it matters: The linchpin of that strategy is a vote in the Senate Wednesday on a measure to undo the Federal Communications Commission’s 2017 repeal of net neutrality rules. It keeps the issue front and center and also will put at least some Republicans on record as opposing it. Twitter has taken what may be its biggest step yet in trying to crack down on its perennial problem with hateful and abusive content. The change in approach is twofold. Twitter is getting rid of a troublesome binary that historically had it either banning a tweet completely or showing it just as much as all other tweets. Twitter now can choose to make some tweets less visible in replies and search results. Twitter is using more than just the text of the tweet to decide how prominently to feature it. New factors that will weigh in include whether someone is tweeting at a follower, whether the tweet's author has verified the account with a real email address, and whether the author has signed up for multiple accounts at once. What they're saying: "These signals will now be considered in how we organize and present content in communal areas like conversation and search," Twitter said in a blog post. "The result is that people contributing to the healthy conversation will be more visible in conversations and search." Why it's a big deal: In the past, Twitter users have reported abusive accounts and posts over and over, only to be told that a particular tweet doesn't violate Twitter's terms of service. That was often true — but that need not be the only metric. It was Twitter itself that had limited itself to either banning a tweet or leaving it in full view. My thought bubble: Speaking on a panel for the Hack Harassment effort last year, I made the case that the big platforms were already using their algorithms to boost some posts and downplay others. Why not, I argued, use that power to evaluate content and make what appears to be problematic content less visible? And it's already getting results. Twitter says tests of the new system showed a 4%–8% improvement, as measured by fewer people reporting abusive content. Yes, but: If not implemented carefully, any approach like Twitter's new system runs the risk of also silencing unpopular minority voices, particularly if users find ways to game the system to hurt their critics. And we are sure to hear outcries as well from those who are seeing their tweets downplayed. The bottom line: Twitter has been criticized in the past for not doing enough. This time it's trying something new. Let's see how it works. The smartphone patent wars are over, but don't tell Apple and Samsung. Like the Battle of Palmito Ranch (fought after the Civil War had ended), the tech giants are back in court to argue how much the Korean phone maker should have to pay for infringing on iPhone-related patents. What's happening now: A San Jose, Calif., jury heard opening arguments and the first witnesses on Tuesday, with Apple hoping to get $1 billion in damages and Samsung arguing $28 million would be more appropriate. Why are we here? The retrial was necessitated after Samsung successfully argued before the Supreme Court that the scope of a patent verdict can be narrower than had previously been allowed. What's at stake? It's really about money at this point. The phones at issue have long since been replaced. For some dated, but interesting background, here's the 2012 primer I wrote on the case, the players, and the stakes at the time. The smartphone patent wars were a big deal in their time, with a range of cases involving many of the big players in the industry. The Apple-Samsung case was especially closely watched as Samsung was both Apple's biggest rival and a key supplier. That said, what Apple really wanted was Samsung to change the way it designed phones — and it lost the opportunity for that when it failed to get an injunction banning the sale of the phones at issue in the case. How long has this case been going on? The initial lawsuit was filed in April 2011 followed by a 2012 trial. Several of the original lawyers (including Apple general counsel Bruce Sewell) have since retired and one died last year after a battle with cancer. The law that made marijuana legal in California this year also provides a means for those previously convicted of pot-related offenses to have their records expunged. What's new: Code for America is trying to use technology to help speed and automate that practice. Since San Francisco had already said it would look to proactively vacate past convictions, it's holding its pilot program there. The program will scan through nearly 5,000 felony marijuana convictions dating back to 1975, determine which are eligible to be cleared, generate the forms and create a PDF of the necessary motion. “When the government uses 20th century tools to tackle 21st century problems, it’s the public that pays the price. ... California has decriminalized recreational cannabis use, but a marijuana conviction continues to serve as a barrier to employment, housing, student loans and more." The Senate Judiciary Committee today is holding a 10am hearing on Cambridge Analytica and the future of data privacy, featuring whistleblower Christopher Wylie. Cisco earnings are today. Yes, I had them in yesterday's Login for Tuesday, but they are today. Really. Kim Hart is moderating a fireside chat with Steve Case this morning at the National Venture Capital Association's conference in D.C.
MIT's Solve conference kicks off later today. Speakers include Canadian Prime Minister Justin Trudeau, Google's Eric Schmidt, former Xerox CEO Ursula Burns, and cellist Yo-Yo Ma. Intel has reassigned chief marketing officer Steve Fund, according to the Oregonian. CEO Brian Krzanich says Fund will work on unspecified "special projects" and report to the company's general counsel, while marketing and communications will temporarily be handled by its sales organization head. HR startup Namely fired CEO Matt Straz after an internal investigation, Forbes reports. Facebook told British lawmakers that CEO Mark Zuckerberg has no plans to testify before a parliamentary inquiry there, nor does he intend to travel to Britain "at the present time." The White House eliminated the role of cybersecurity adviser, though some Democrats are trying to save the post through legislation. Tencent earnings topped expectations, per CNBC. Alphabet's Jigsaw will extend free cyber protection to political campaigns. Remember the debate over which colors were in that dress? Now there's the audio equivalent and the split is just as intense. Do you hear Laurel or Yanny?